The bimetallic tube is composed of two different materials - usually inner material is a corrosion resistant alloy (copper, aluminium brass or Cupro nickel) whereas the outer material is a high-stress resistant alloy (Brass, stainless steel or carbon steel). It is, however, possible to manufacture bimetallic tubes with any material combination as per the requirement & availability. In applications with high pressures and corrosive conditions, bimetallic tube permits large economical savings in comparison with a tube made of a single alloy, since the use of precious materials is reduced to the minimum. 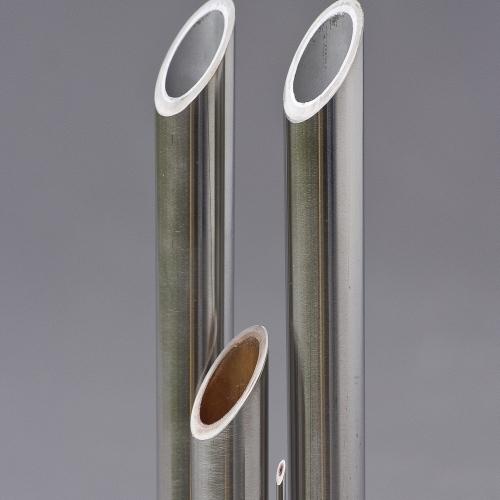 Bimetal tubes combine the positive properties of different materials for use in various media. Bimetal tubes are a safe and economical solution for heat transfer in aggressive media since expensive, corrosion-resistant materials can be combined with less expensive ones. We manufacture these tubes through the rolling & drawing process which gives flawless cladding between two different metal tubes. ► In order to increase the area of the tube for better heat transfer, helical fins can be formed on outer tubes surface, if required. Fin density of 11 FPI to 26 FPI can be accommodated, depending upon the Customer’s specific requirement.